K is one of a handful of refugees from Chechnya’s persecuted LGBTQI+ community who has been bold enough to talk publicly after fleeing the wave of persecution directed against the marginalized group. Some survivors detail abuses endured at the hands of authorities in the Caucasian republic, while others relate the struggles and joys of integrating into the new societies that have granted them asylum. K falls into the latter category. “If you ask me what I would wish Russia for the New Year, I would say democracy; respect for human rights. Luckily, I don’t miss my past or Russia, probably because too much misfortune befell me there. I’d like to miss Russia, but apart from indignation, I don’t feel anything,” said K, who is so afraid of retaliation that he requested to be identified by a single letter and gave his testimony only on condition that his country of refuge not be revealed. The victims started fleeing in mid-2017. On 1 April 2017, Russian newspaper Novaya Gazeta published the first of a series of harrowing exposés on the violent purge against Chechnya’s LGBTQI+ community, revealing that over 100 people had been detained, often without evidence, on suspicion of homosexuality in the previous weeks and that three had lost their lives in extrajudicial “honor killings” – an ancient tradition in the predominantly Muslim Chechen Republic. The newspaper referred to “an unprecedentedly large number of sources,” including the local Ministry of Internal Affairs, the administration of the head of the republic, the local division of Russia’s security service the FSB, Chechnya’s prosecutor’s office, and local LGBTQI+ activists. Some of those sources, the newspaper alleged, were directly involved in what they called a “preventive cleansing” operation. “It’s enough for the family [of the persecuted] to learn of the reason behind the detention [i.e. that their loved one is gay] for relatives to refrain from filing a complaint with the authorities and carefully conceal the very fact of the detention and even their loved one’s killing,” read Novaya Gazeta’s first report. The newspaper’s claim was reinforced several months later when Chechen leader Ramzan Kadyrov called gay people “subhuman,” denied that they exist in Chechnya, and condoned honor killings, a tradition that sanctions the murder of relatives who defy a family’s notion of honor, first and foremost with regard to sexual morality. Kremlin-appointed Kadyrov first assumed office in 2011 with the understanding that the authoritarian leader would quell secessionist impetuses in the oil-rich Chechen Republic – an endeavor he achieved by violently cracking down on dissent and imposing media censorship. In recent years, however, his implementation of Sharia law is believed to have fuelled tension with Moscow amid concerns that Kadyrov is relaxing his commitment to the center and vying, instead, to assert himself as an authority figure in the Muslim world. “Homosexuality is a huge taboo and a source of great shame in Chechnya,” said a representative of The Russian LGBT Network in a February 2019 interview. The Network is an interregional human rights NGO that provides Russia’s LGBTQI+ community with social and legal aid. Victims cannot always rely on their families for help. Ironically, the primary motivation behind their silence is a desire to protect these very family members. For this reason, all but one account are anonymous to this day, because those who have escaped persecution fear retribution against the parents, siblings, lovers they have left behind. The only survivor who has identified himself thus far is Maksim Lapunov, who was abducted on the street in the Chechen capital of Grozny in March 2017 and viciously beaten by police in a cellar over the course of 12 days. NGOs involved in helping victims escape both Chechnya and Russia reiterate that survivors put their lives at risk in revealing even minor details about their escape and countries of refuge. On Jan. 11, 2019, Novaya Gazeta reported details of a second purge that saw at least 20 people murdered in December 2018 alone. Unlike that of 2017, the new wave of torture has barely produced any first-person accounts, even those that are anonymous. Social justice organizations and NGOs are determined to protect survivors’ identities both while they negotiate for asylum with other countries and afterwards. A gay man going by the pseudonym Aleksandr Mironov called this new purge a “genocide” in an interview with Meduza on January 14. The young man, who is from the Caucasian republic of North Ossetia and has been granted asylum in France, also wanted to conceal his full name for fear for his relatives’ safety. 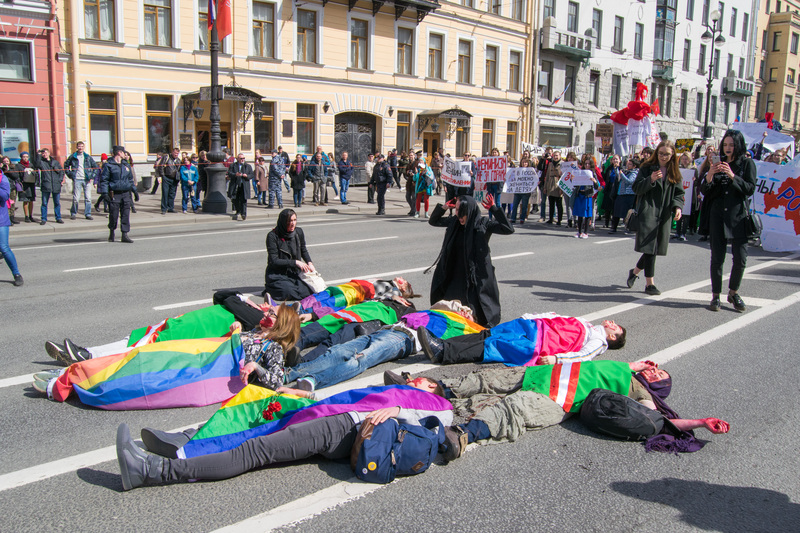 The current wave of persecution has been confirmed by numerous NGOs, including The Russian LGBT Network, whose representative said in an anonymous interview that “the attention of the international community” was instrumental in stopping the first wave of persecution. The representative hopes that the current wave of persecution will similarly stop as a result of pressure from outside Chechnya, most notably in the form of a recent report by the Organization for Security and Co-operation in Europe (O.S.C.E. ), the body that committed the Soviet Union to observe human rights as part of the 1975 Helsinki Accords. Pressure from NGOs in Moscow is also expected to play a part. “We are not going to stop and will seek justice both in Russia and outside of the country,” the representative said. According to the Network’s representative, victims are leaving Russia at divergent rates. “There are people who leave very fast and others who stay with us for many months. Decisions are made individually, on a case-by-case basis, depending on many factors, including a person’s story, health, and emotional condition.” Neither the Russian LGBT Network nor other LGBTQI+ groups in Western countries were willing to divulge any details regarding the countries or even the continents to which survivors of the current wave are being evacuated. “We believe that it is our responsibility before the victims to allow them to get ‘lost’,” said the Russian LGBT Network representative. While many refugees from the previous wave have happily integrated into their new societies, others continued to fear for their lives even in what should have been physical safety. In May 2017, Berlin-based journalist Dmitry Vachedin reported for Meduza that a gang of armed Chechen immigrants was threatening “their compatriots with death for immoral conduct” in that city. The Russian LGBT Network representative declined to comment on whether second-wave refugees are currently experiencing similar challenges in their new countries of asylum, but did provide four links to anonymous online testimonies, among them that of K, to suggest that at least some of the refugees were getting the help that they require and assimilating well into their new societies. Though K came from the first wave of persecution, it is unclear when he left Chechnya precisely, how he escaped Russia, and where he settled. Nevertheless, his testimony, which was published on The Russian LGBT Network’s page on Russian social media platform VK, reveals a portrait of relief and homecoming. K lives in the center of a big city, is learning the language of his new homeland, has a job and a boyfriend – a local he met in his country of refuge. For the first in his life, K feels that most of the heterosexual people who surround him are not quick to discriminate against him because he is gay and react with genuine outrage when he shares stories of how badly LGBTQI+ people are treated in Russia.